Recently on a warm, overcast day, our young engineers gathered together, excited to take the 5-minute drive down the road on a field trip to HD Fowler. We were grateful for the opportunity to visit the contractor’s new Woodinville site to review different materials that we specify every day in our plans. Our team expanded since last year’s field trip to a contractor’s yard, so many of them didn’t know what to expect. There is a huge benefit in getting a different perspective on the work we’re doing, but it’s not often considered in the moment. LDC Inc. strives to empower its employees to truly learn their craft and understanding of design from every perspective. Bryan, the branch manager, was kind enough to organize the day for us – he brought in two sales representatives to provide us with valuable information and he also supplied us with donuts upon our arrival. I had visited the site earlier in the week to familiarize myself with the materials, so I led our group of about 15 to the most valuable corners of the yard. 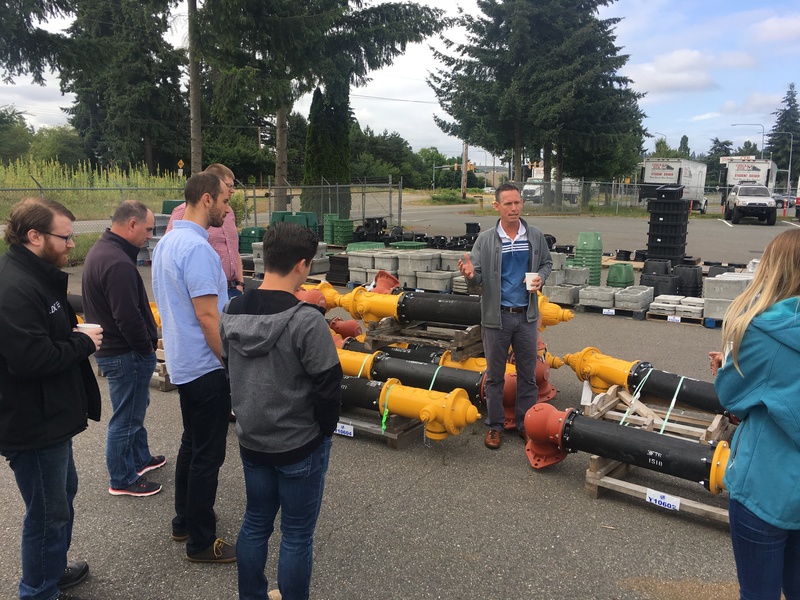 There were many things to see – fire hydrants, stormwater control structures, double check detector assemblies, various pipes and fittings. Not only did our team get a hands-on experience with the materials, but we also got an in-depth explanation accompanied by answers to our questions right on the spot. Our newer engineers benefited from seeing how the materials they work with on paper actually play out in real life. In addition to seeing the materials in person, Bryan and his team also explained some of the common challenges faced out on construction sites from his perspective. When construction plans are in progress, each player is focused on a small part of the puzzle. Now, when our engineers work through their design and specifications, they have a clearer grasp on how their decisions affect the bigger picture. It helps what we do behind the scenes to translate into more comprehensive, efficient, and effective work overall. We would like to take this opportunity to thank Bryan and his team at HD Fowler, Woodinville, for taking the time to show us around. It was an incredible experience that both inspired and enlightened our team. Since we have a growing team at LDC Inc., there’s a good chance we might turn field trips into an annual tradition!